Ever felt the urge to build something with wood, but simply lack the time? The truth is, you can get started comfortably over a weekend. Or even just an evening. Whether it’s your first build or your thousandth, we want to show you just how many simple projects are out there to choose from. It has TONS of ideas for simple wood projects and links to full build instructions for every single one. You’re sure to find it both inspiring and motivating, and we think you’re going to love it! And best of all: There are video instructions to help you every step of the way. Click here and start building! After measuring simply glue the pieces together and brush with a clear finish. Voila – you are now the proud owner of a new media box! Last but not least, don’t forget to use wood stain to make the bed long-lasting and funkier. 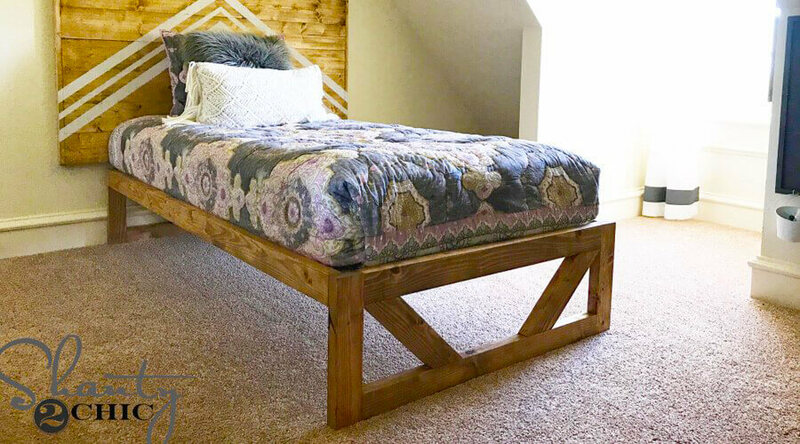 There you go – a simple modern bed built in just a few hours and without any hassle. A home just wouldn’t feel the same without any plants, don’t you agree? This wall planter looks delicate, cozy and is big enough for both your plants and books. A planter and a shelf at the same time – this is a must-have! 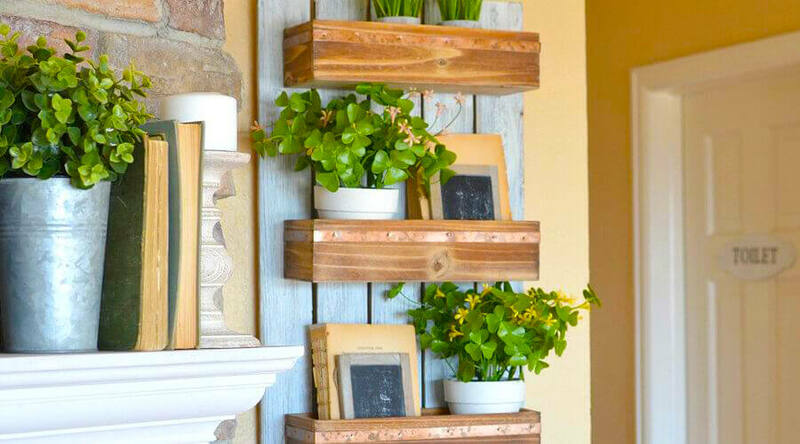 The wall planter is made using pre-made wooden pallets which can save you a lot of time – just go to your local craft store to find something similar or use old wooden boxes, both will do the trick. 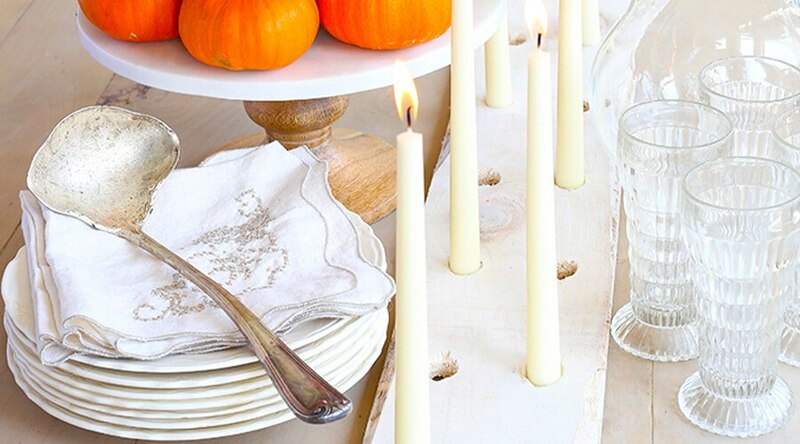 A little paint and sanding is all these needs for the perfect rustic look. 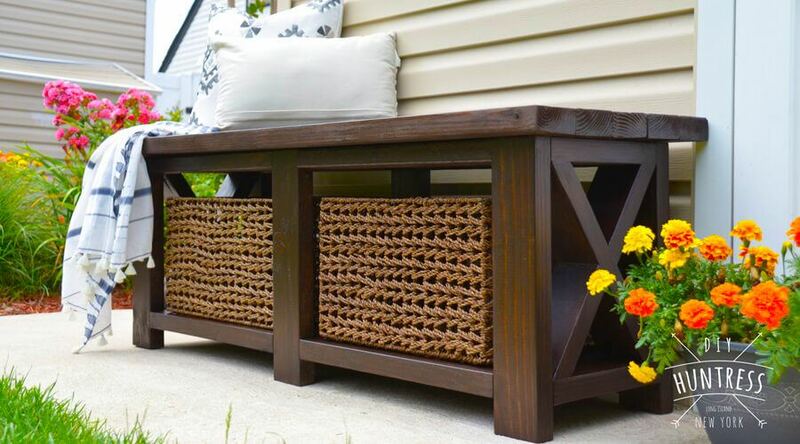 Building the whole wall planter will take just a few hours which makes this the perfect afternoon project! You can also change the size and angle of the stand according to your personal taste, same goes for the finish you choose for protecting the wood. Even if you don’t have tons of experience under your belt, this tutorial is simple enough even for beginners! First just cut out little circles of the plywood board using a hole saw. Glue the circles together, clamp them and wait for the glue to set. Afterward just sand the candle holders and drill a hole where the tea light could sit in. 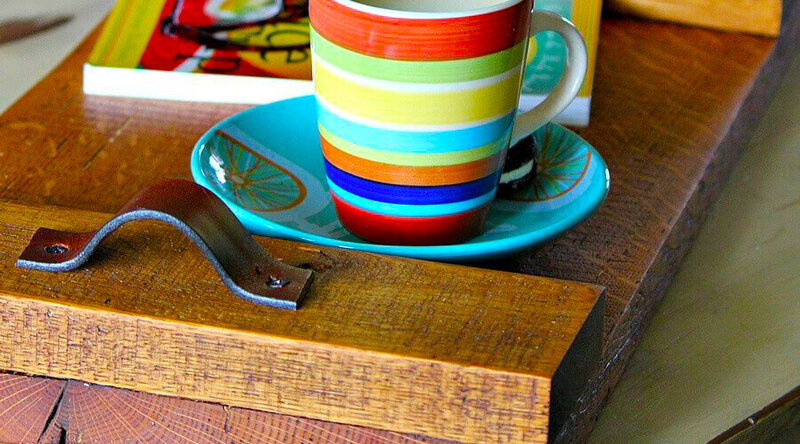 If you have the tools and some scrap plywood, you can give this DIY project a try this weekend. It will literally take just a few hours! Using reclaimed wood for food serving tray is completely safe though if you sand the surface and seal it with food-safe finishing products. But the thought of having a “cow urine serving tray” is still cool (and a bit strange too). 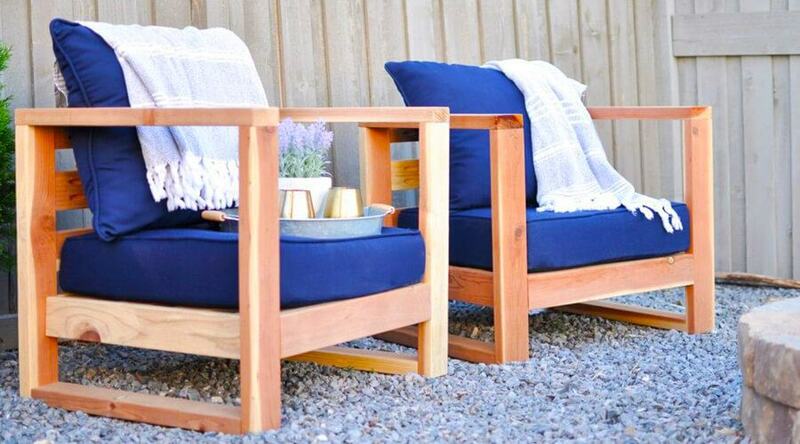 If you’ve searched for easy woodworking projects, then you have definitely seen this one! 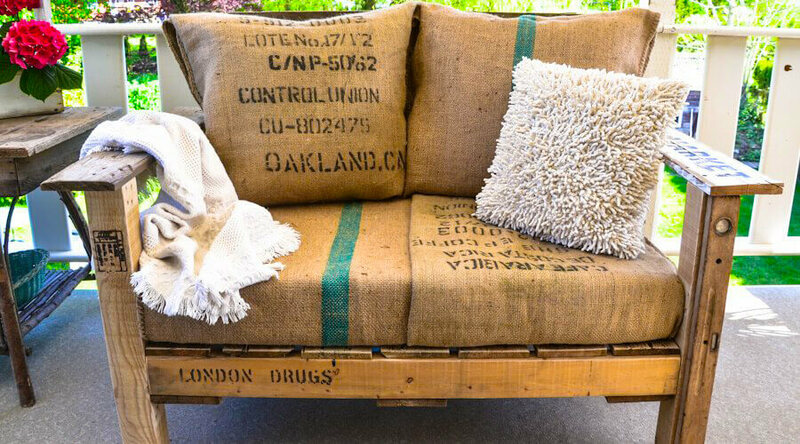 This sofa sleeve tutorial is created by A Beautiful Mess and it will once and for all solve the dilemma that occurs when you want to drink a hot cup of coffee but simply doesn’t have any place for it while you’re reading or watching TV. The absolute hardest step is cutting the triangles which need to have 30 and 120-degree angles. Though cutting the triangles is not really tough, you do need to have patience and accuracy – it can be a bit repetitive. But hey, all for a mesmerizing result, isn’t that right? 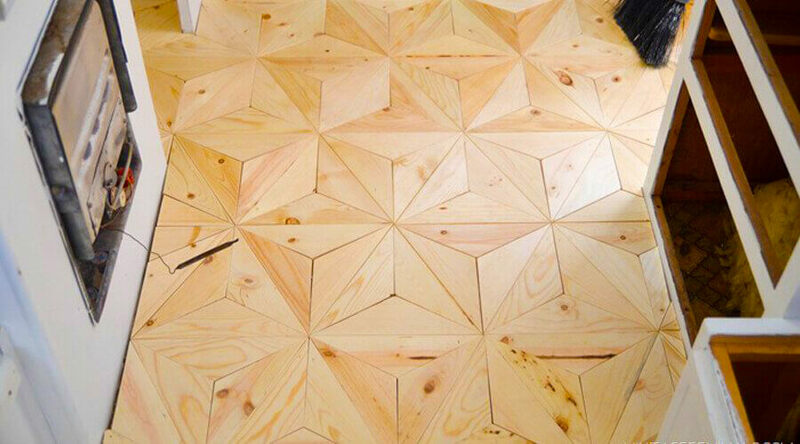 If this flooring is used in the hallway, it will be a real showstopper! All that effort is worth it! 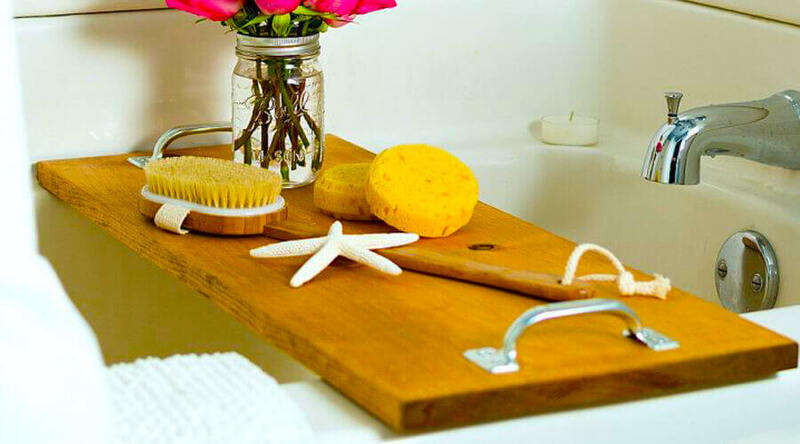 This nifty bath caddy tutorial is perfect for all bath lovers. You can just relax and enjoy your bath without having the fear of your phone accidentally falling into the bathwater. You’ll just need 1 x 12 pine, some sandpaper, wood stain, and hardware. Building a bath caddy literally couldn’t be easier! 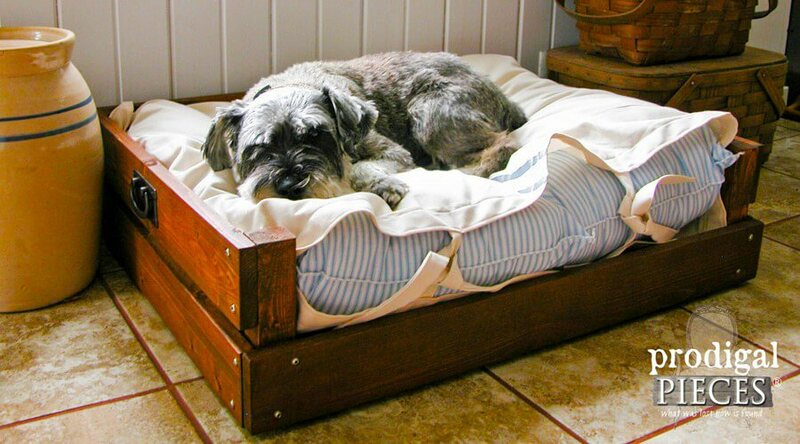 If you already have some reclaimed wood, then this project will barely cost anything. Friendly on your wallet and comfy for bath time – this is a great combo! 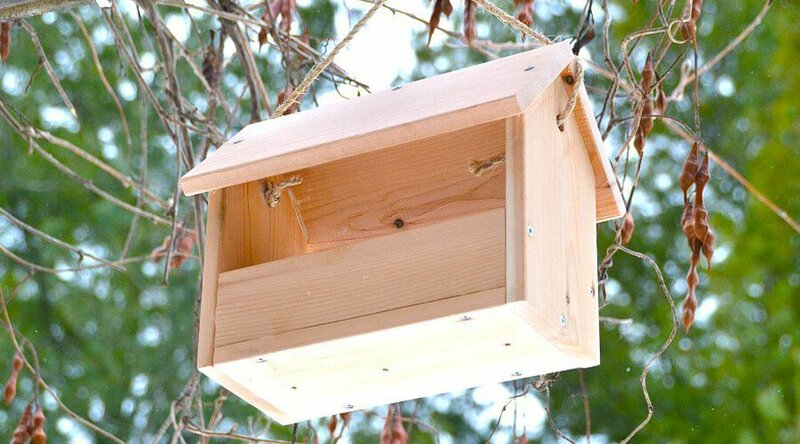 Birdhouses are usually the first projects you tackle when you start with woodworking, so this DIY bird feeder project is the perfect weekend project. It’s simple and practical, but on top of that – it costs just $4 to make and takes only 20 minutes! All you’ll need for the project is a few cedar boards, wood glue, screws and a few simple tools. Cedar is recommended for this mainly due to its great durability outdoors so you don’t even need a finish, but for extra protection, you can, of course, use a finish of your choice. What makes this project even cooler is the creative freedom you have. You can align the holes whichever way you like – what matters is that you like the result and it fits your dining table! 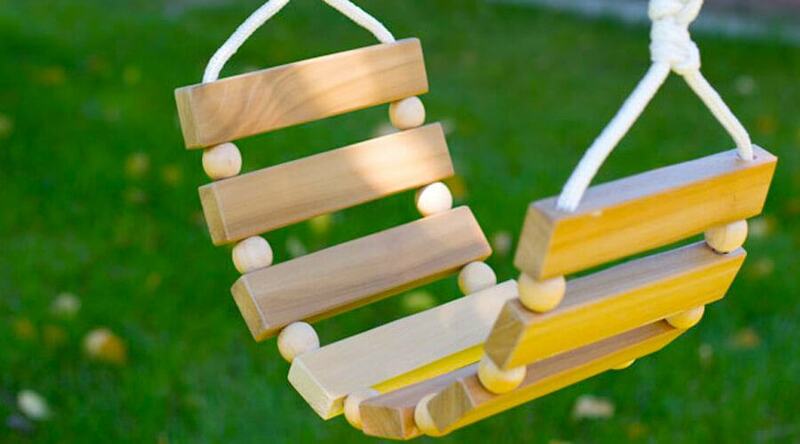 To build the swing, you’re going to need some wood planks, wooden beads, rope and a few other items that you probably have laying around the house already. Besides the project is so easy that all you need to do is drill a few holes, the finished swing looks great too! Some wood stain, color and sanding and you’ll be good to go. If you make several sets at once, one tray of the blocks will cost you less than $10! You’ll need 4×4 scrap wood (which I’m sure you have somewhere around the house already). The only tool you are going to need is a drill. It couldn’t be easier! 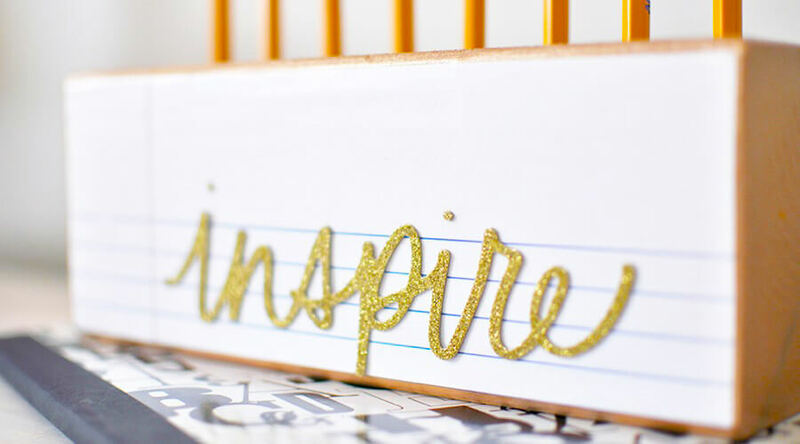 After drilling, you can decorate the pencil holder with scrapbook paper and Mod Podge and apply a sticker on the paper, but as with any DIY project, you can feel free to decorate it according to your taste. The end result will definitely look dashing! You just got to love scrap wood projects. 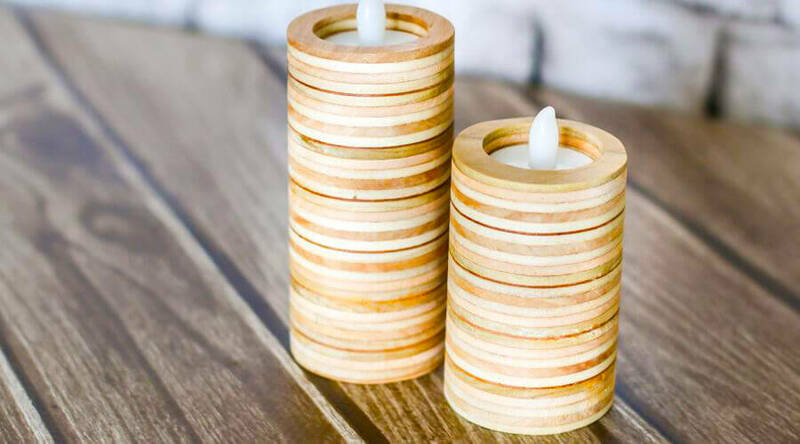 After seeing this tutorial you’ll never want to throw away scrap wood again as you can just easily turn those wood bits into cute decorations. 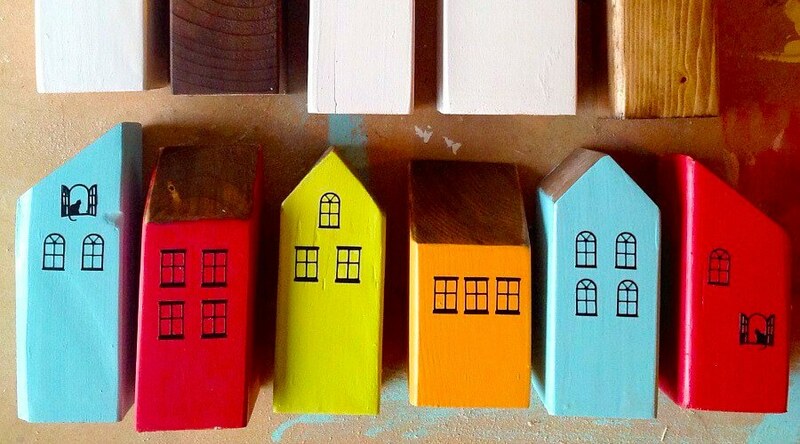 Similar wooden houses like these have been sold even on Etsy before, but you can bet these DIY decorations will cost you a lot less – they cost virtually nothing! In this project, you can just go completely wild and use all kinds of wood bits you have laying around, no matter the size or angle. In fact, the quirkier they look, the cooler! You’ll need to sand you’re the bits and then paint them the way you like – you can paint them colorful as in this tutorial or get minimalistic and paint them black and white. Why not include kids as well and let them paint an entire village? That will be one afternoon well spent! What we love about this project is not only the simplicity of making it but the minimalistic look it has. If you want to fancy it up, you can, of course, use some color too. 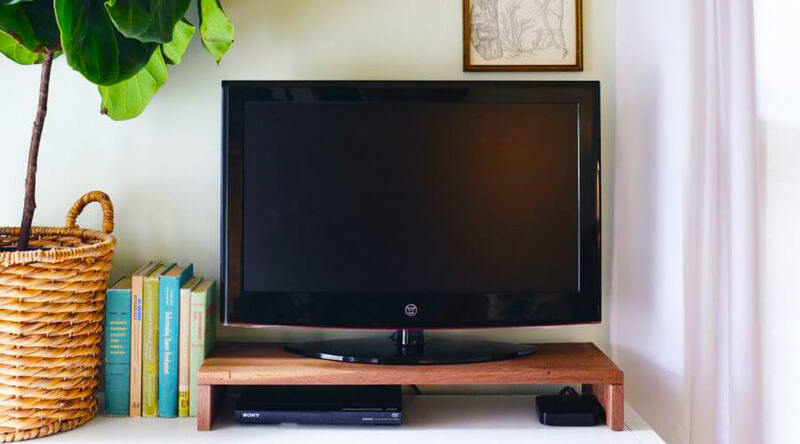 There’s no reason to through away old lumber – instead, you can use it for this nifty project. 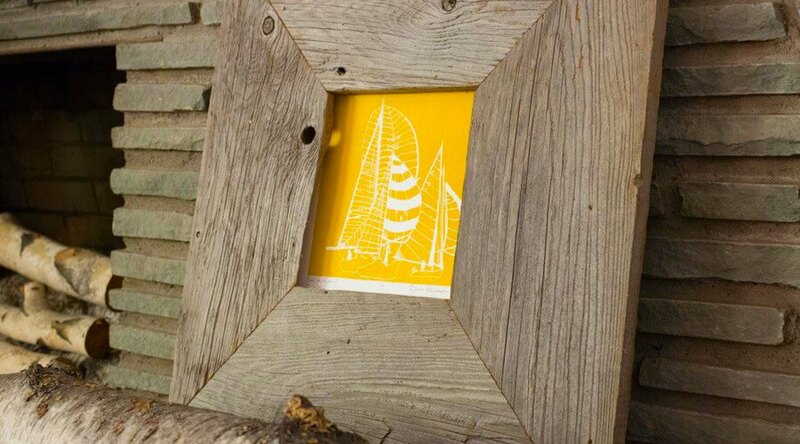 This project features reclaimed wood, giving the perfect rustic and homey look to the picture frame. The end result is beautiful and despite the reclaimed wood, it actually looks expensive! If you’re looking for a way to display your family photos but find it tough when photos have different dimensions, then this clever project comes to the rescue. 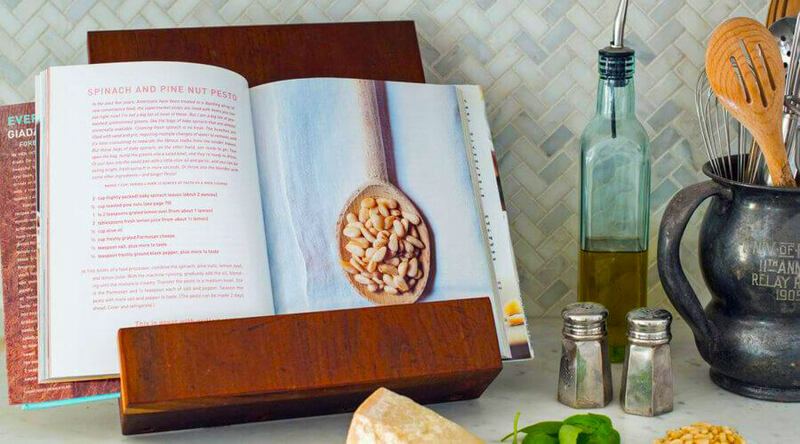 Thanks to this cool idea, you can easily showcase all photos, no matter their size – and you don’t have to worry about finding picture frames with the right dimensions. 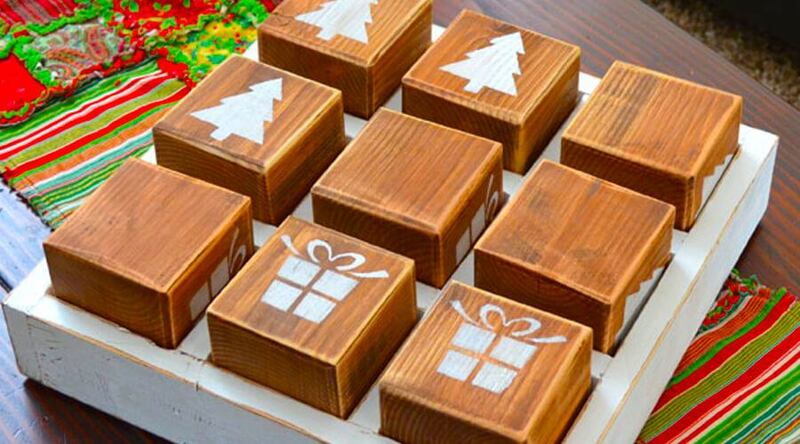 You’ll need some wooden blocks (why not use scrap wood), glue, spray paint and some clothes pins that you can attach to the back of the wooden block. It couldn’t really be any easier! Though the idea behind the project is so easy, these little picture holders actually look amazing and fit perfectly into a modern home. 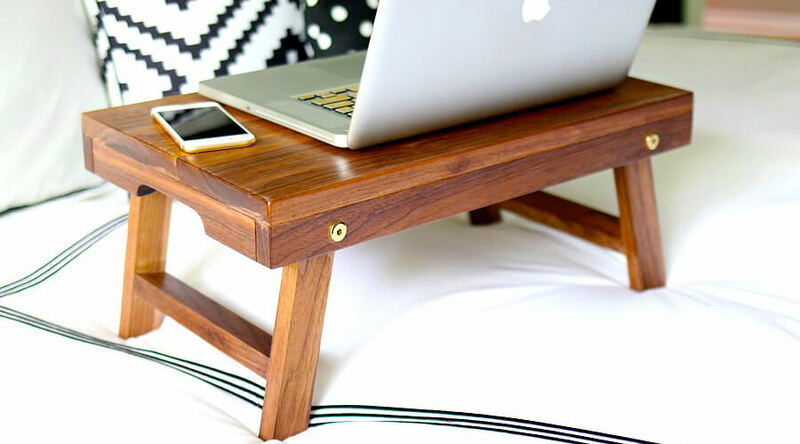 Are you constantly working in your bed with a laptop? 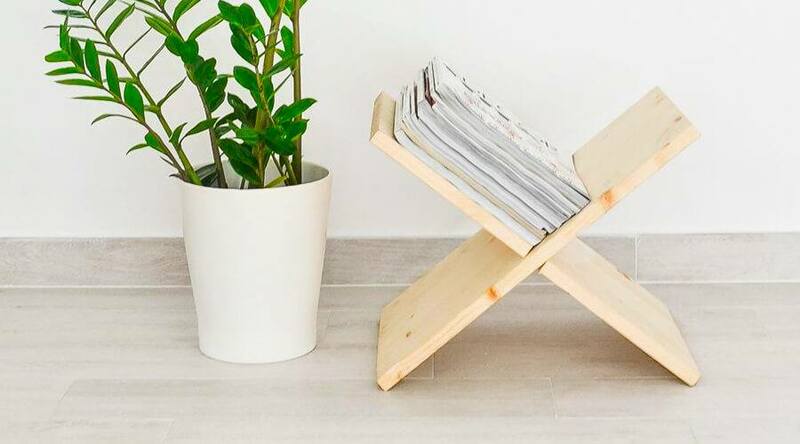 This folding lap desk is the perfect solution for the modern lifestyle and makes your life tons easier! Jen from The House of Wood presented this cool idea as her contribution to the one-board challenge. The challenge was to build something out of one 1×8 board. 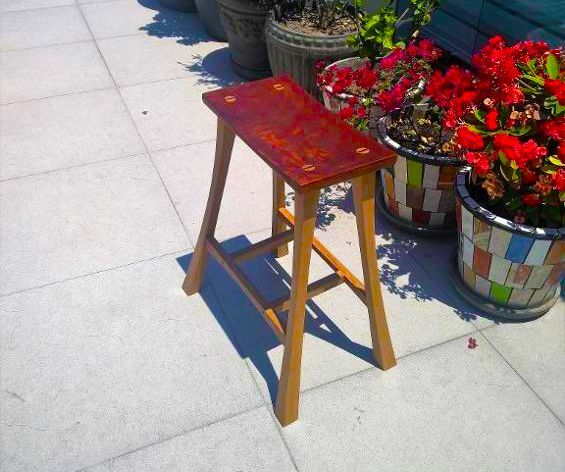 The lap desk actually has folding legs as well for saving some space. Clever, isn’t it? We at Woodwork Boss are all about organizing your home in clever DIY ways, so this tutorial by The Kim Six Fix instantly caught our eye. 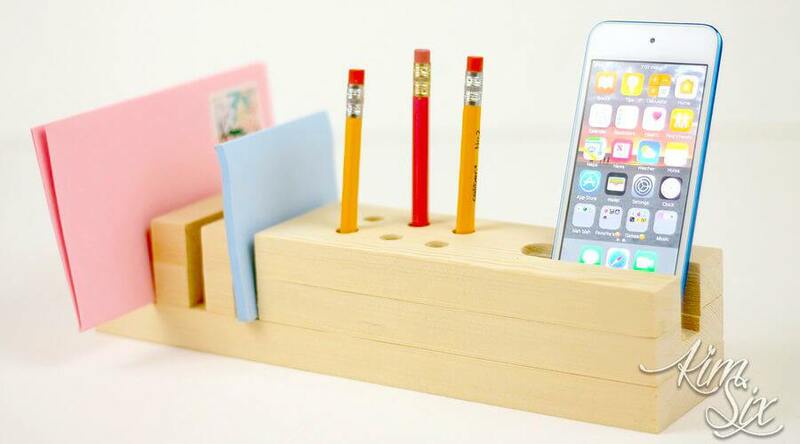 A desk organizer made from a single 1×3 board and that fits pencils, notes, and a phone? Could it get any more perfect? As a final touch, you can paint the organizer with your favorite colors – just to give it a nice finished look. Now you’ll have no excuse for a messy desk! 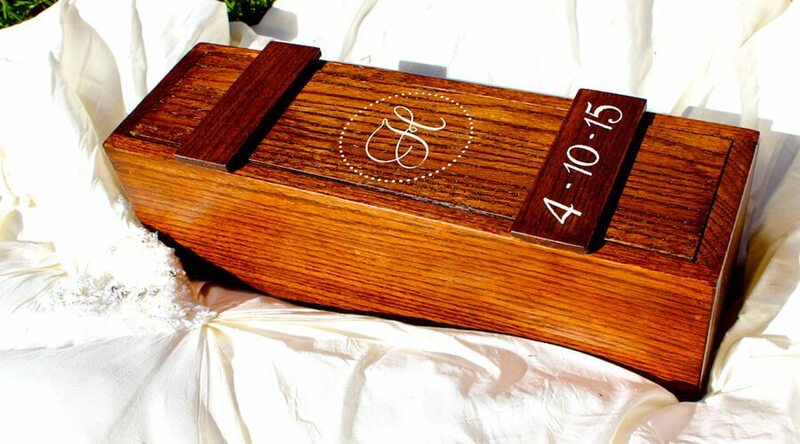 To turn this beautiful box into a meaningful wedding gift, just paint the couple’s initials and wedding date. There you go – just one afternoon and you’ll have the most impressive wedding gift ready! This mid-century style nightstand looks like it just jumped out from the cover of a decor magazine. 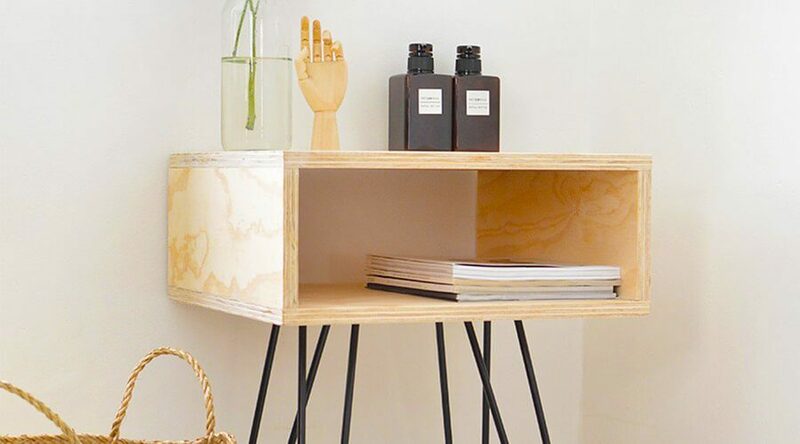 Simple rectangular shape and hairpin legs look simply brilliant together, especially when the wood is untreated. 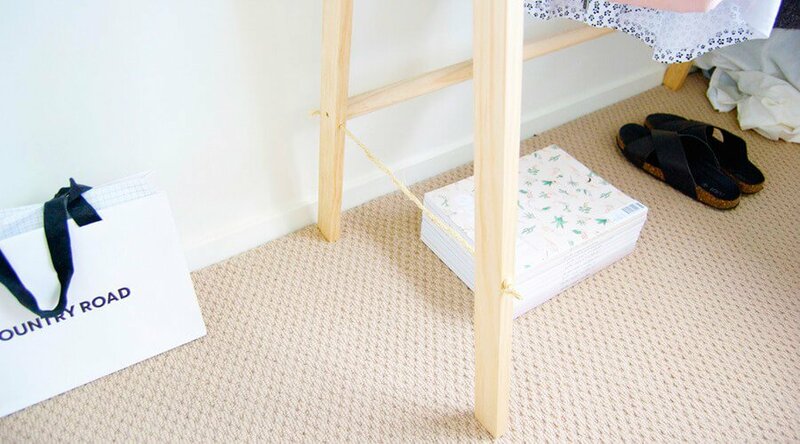 As the nightstand is made out of plywood, it’s also budget-friendly! 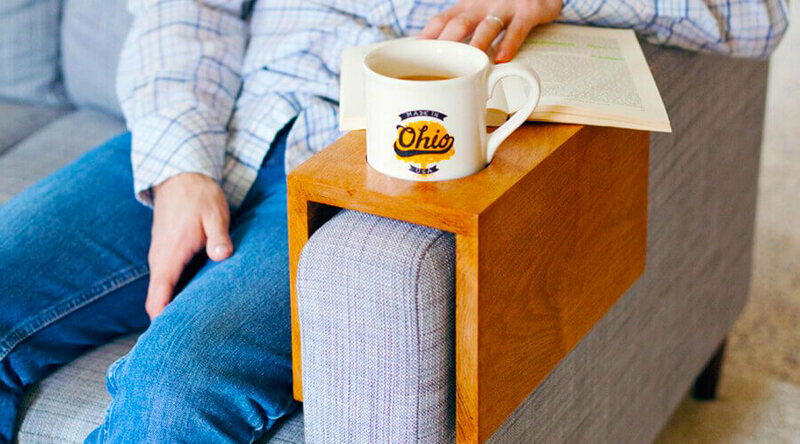 The same idea could easily be applied to making something bigger, such as a coffee table. Or you can take this even further and use some other wood, such as pine. The choices are endless! This project simply proves once again that simplicity is the best. Practical and gorgeous – this one really is a heart-stealer! Here’s another project for wine lovers. 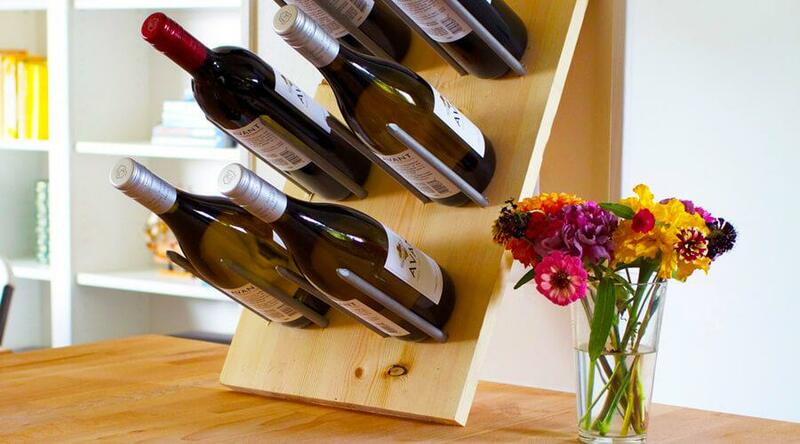 With this simple wine rack, you don’t have to store your beautiful wine bottles in a cupboard. 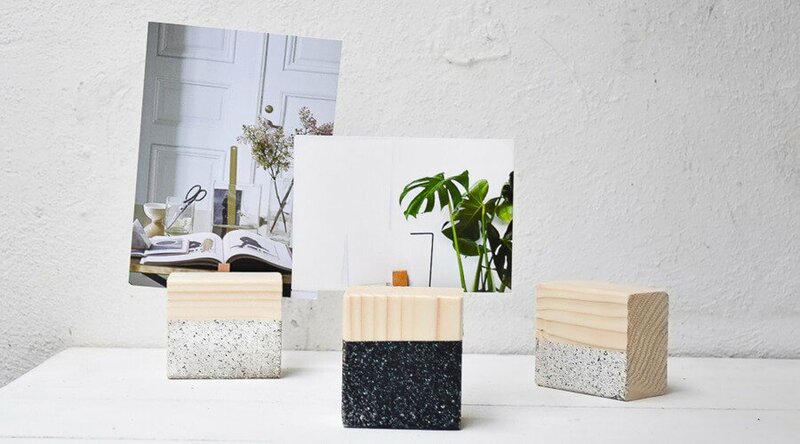 Instead, you can showcase them on your kitchen counter! As always, you’ll need a few wood boards and a miter saw. Just nail them together and you’re done! You could also use wood glue if you prefer that, but in that case, you need to be patient. 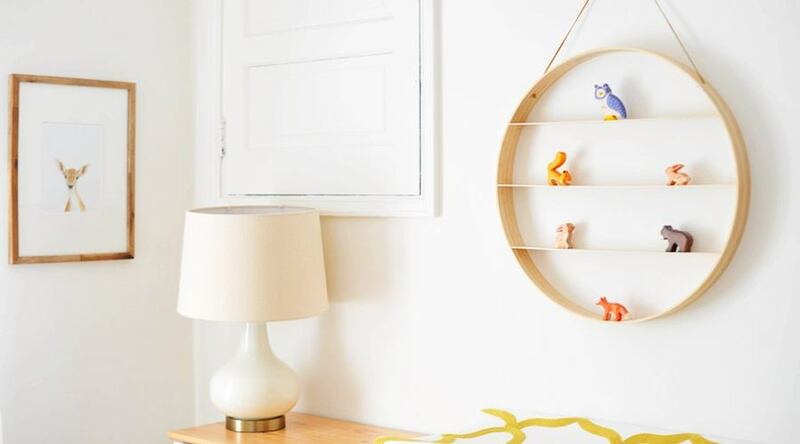 One way or the other, you can easily make 10 or even more of these shelves within just one weekend. You’ll need a few 2×4’s and one 2×2 and some tools, including a pocket-hole jig, a drill, a miter saw and few other woodworking essentials. 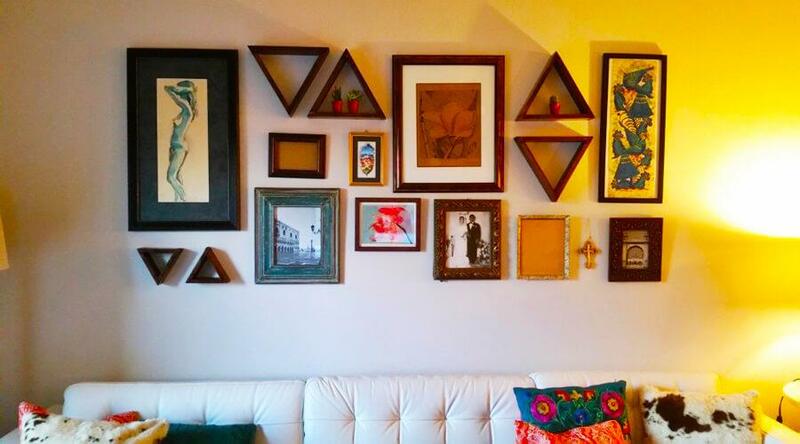 Once you have the tools and materials, the rest is easy: cut the pieces according to the cut list, create the frames, x-s, and shelves, then assemble all pieces together. As you might have noticed from the images, it’s not only a nice sitting area, but it also functions as an extra storage space. Clever! The wood of choice here is redwood as it has natural tendency to resist to warping, shrinking and another ugly phenomenon that might happen with outdoor furniture. Other than the wood, you’ll need some regular tools such as a drill, a table saw, and an orbital sander. The result is simply breathtaking and very impressive. We can bet if anyone sees your brand new nightstand, they’ll wonder where you bought it from – that’s simply how good it will look! As pallets themselves are rather uncomfortable, don’t be afraid to splurge on pillows. In the end, that’s what will give true life to this project! Start with Woodworking right here!